Yesterday I mentioned writing nightly meals on my calendar in my kitchen command center. I have never been that great at planning meals. In fact it became such a chore because I found myself always cooking the same meals again and again. 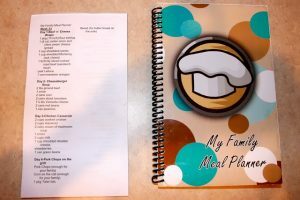 Then I found My Family Meal Planner and my planning is now almost non-existent. On the left of the picture above is the magnetic weekly grocery list. Here it breaks each week up by easy, simple meal. She also includes a different vegetable and fruit with each meal. On the right is the recipe book. On the other side of each grocery list is the same list only divided into categories (dairy, meat, etc.). This is what I use to check my pantry inventory and then transfer what I need to my regular grocery list. So easy. The recipes are in alphabetical order for easy reference. The ones with gray boxes around them are crock pot meals (there is one of those each week). As you can see, mine has been used quite a bit. I like to put smiley faces next to the ones we really liked, checks for those that were okay, and although there aren’t many, frowny faces for the ones we didn’t care for. I also put little notes if needed. I figure I could cut out the ones we really liked when I’m finished with the book and glue them to index cards or put them in my recipe binder (for another post). I am not being compensated in any way to pass this information along. Just found something that has been useful to me and thought I’d pass it along. This really has helped me tremendously as far as meal planning goes. I just checked out the site again recently and noticed she has added quite a few new types of cookbooks to the collection. You can check it out here if you are interested. I think I am definitely going to have to try the Lunchbox Planner. I need ideas in that department too. Tip of the day: Once I am done transferring the pre-made grocery list to my own larger grocery list, I cut it into separate meals and place them in my meal bins in my pantry along side the dry ingredients needed for the meal. That way, if I’m not home for some reason and the hubby needs to step in, he can just grab the bin with the ingredients, a list of what else is needed (from the fridge) and a name of the meal so he can easily look it up in the recipe book.